PT Pertamina (Persero) - Pertamina (hereinafter referred to as "Pertamina Group") is a leading state-owned fully integrated energy company in Indonesia. Pertamina Group running business in fully integrated energy industry both upstream and downstream activities. Its business include oil and gas, renewable and new energy. 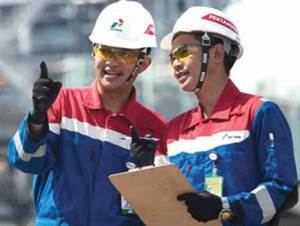 Headquartered in Jakarta, Pertamina Group runs its business through 23 directly-owned subsidiary companies, 6 associate companies and 7 joint venture companies. The Company also supported by 6 refinery units, 8 marketing operation regions spread across Indonesia. In term of financial performance, PT Pertamina (Persero) recorded total revenue of US$ 31.99 billion in the third quarter of 2015 (3Q2015, ended in 30 September 2015). This reflected a 41.3% down from US$ 54.50 billion from the same period last year primarily due to lower oil prices. Total current year profit in 3Q2015 was down 45.72 % at US$ 0.924 billion from US$ 1.7 billion in 3Q2014, according to PT Pertamina (Persero) Financial Highlight 3Q2015 as cited by JobsCDC.com. Minimum graduate with Bachelor of Engineering (Electro Engineering, Industrial Engineering, Mechanical Engineering, Electricity Engineering, Electrical/Electro Engineering). Minimum 8 years of experience in IPP development and or the development of Renewable Energy business primarily in the fields of Hydro, Solar PV and Wind. Preferably listed as a board or members of the Society of Electricity Indonesia (Masyarakat Ketenagalistrikan Indonesia/MKI). Have the knowledge, skills, and implementation of the Renewable Energy field, especially in the field of Hydro, Solar PV and Wind Grid Management. Have a good understanding of NRE business process. Mastering Commercial Aspects and Power Purchase Agreement. Have a good skills in Project Managemen, Energy management and Stakeholders management. Minimum graduate with Bachelor degree in any majors, preferably of Accounting, Financial Management. Bachelor degree (S1) with 6-9 years of work experience. Master Degree (S2 with 3-6 years of work experience. Previous experience in Finance, preferably in the field of Accounting. Holds at least 3-6 years in Jr. Analyst or Jr. Officer level. Minimum graduate with Bachelor degree in any majors, preferably of Business, Management. Bachelor degree (S1) with 12-15 years of work experience. Master Degree (S2 with 9-12 years of work experience. Holds at least 6-9 years in Analyst or Officer level. JobsCDC.com now available on android device. Download now on Google Play here. Please be aware of recruitment fraud. The entire stage of this selection process is free of charge. PT Pertamina (Persero) - Analyst, Senior Analyst, Assistant Manager Pertamina June 2016 will never ask for fees or upfront payments for any purposes during the recruitment process such as transportation and accommodation.